In late August I sent my dear runner friend Pipin in Jakarta a purple Salomon running vest. She was so happy that she posed a picture of herself in it while out running trail with a friend. I think what Pipin loved so much about it was how it matched her purple Salomon XR Mission shoes! But she wasn’t wearing those when she snapped this photo. Last week, I received a package from Indonesia and I knew immediately who it was from. Pipin sent me not one but 2 t-shirts back in return! I was very happy. Especially since my Mom actually went to retrieve the package from the post office for me because she had missed the postman at home. Thanks, Ma! 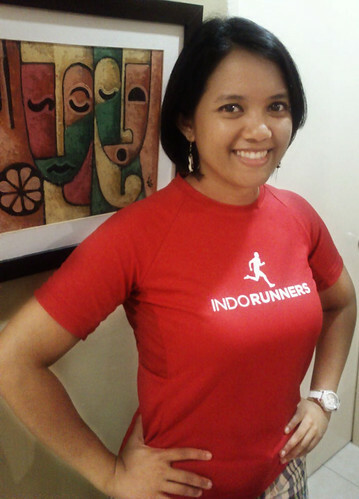 One was a t-shirt I definitely had wanted, the classic IndoRunners lady’s running top. The size was M, and not just any M, INDONESIAN Medium (yes, more snug than Malaysian M!). I definitely can’t gain any more weight if I want to continue wearing this tee! ‘Ngam-ngam’, as we Malaysians say. The IndoRunners t-shirt is unique in that the armpit area is made of breathable mesh so ample air circulation is to be expected around these hot spots (but I have yet to test it). Behind and underneath the neck region is where sits the IndoRunners logo with the group’s URL and memorable motto: Mari Lari. Nice, simple and concise. The second tee Pipin sent was from Angel of Change, a 12k charity run that took place on 22nd September in Sentul International Circuit, Bogor, which was attended by about 1,050 runners. You can learn more about what YCAB Foundation’s plan is with the money raised from the run by watching this Youtube video. Lastly, Pipin enclosed a motivational piece of literature with some personalized message at the back. These are definitely kata-kata perangsang that many of us runners can relate to and live by every day. Terima kasih, Pipin, for showing me how running can create such strong bonds and beautiful friendships in just a short span of time. Even if we are miles apart. r u going for bali marathon 2013? @ Datuk : Insyaallah kalau timingnya OK. Still waiting for details. You? seksi banget kamu pake kaos merah itu. Boleh temenan gak? @ Lex : Sure, are you a runner? bisa beli tshirt nya yang merah itu?berapaan? @Yusni: bisa dibeli dari IndoRunners – check mereka di Facebook. Harga saya kurang pasti, bisa dicek ama mereka.